Rotary cutters were invented in 1979 by the Olfa company. They made the cutter with a handle and a blade not dissimilar to a pizza cutter. The circular blades are very sharp and replaceable. They can be bought in different sizes, usually smaller blades are used to cut around curves and corners, while larger blades are used to cut straight lines, especially useful when cutting strips. I am amazed at the time I save compared to when my mother use to quilt. She use to mark and cut out with scissors, each individual piece of fabric. It has also improved my accuracy, especially when the technique is done correctly. My mother still asks me how I manage to cut such straight lines! When shopping online for rotary cutters you will now see a large range on the market. This is great as it gives the buyer choices. There are three functions to check for when choosing one. Like choosing a pair of scissors it is best to try before you buy especially if you need a certain handle shape for comfort, for example if you are left handed or suffer from carpal tunnel. I have two Olfa rotary cutters and can highly recommend this brand. One larger one with a curved handle that I find most comfortable as it stops my fingernails from digging into the palm of my hand. The other is a smaller straight handled cutter. I love both and find that I use my larger curved handle one the most. I learnt early on to close my blade every time I put my cutter down, as these can inflict a nasty and annoying cut. The safety device is designed to expose and retract the blade. Make sure you try this function out before you buy so that you are comfortable with the way it works. 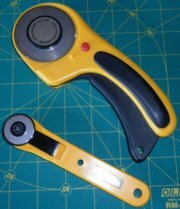 Both my cutters safety devices work differently and I find I prefer one over the other. There is a range of blade size on the market and I advise you to go to your local quilting shop to see what they recommend and also stock. Regardless of which brand, size, color etc you choose to buy make sure you follow the manufactures instructions for use and blade replacement. Don't throw these instructions out. Buy one cutter first and when ready add to your collection as the need arises and you know what works best for you. 1. Change your blades often to keep them sharp and accurate. 2. When changing a blade, pay close attention to how the pieces come apart. Lay them out in the order they were removed and put it back together in the same order. Keep the packaging they came in as this has valuable information about this. 3. Take your rotary cutter apart to clean it of the lint that tends to build up behind the blade. This will help to keep your cutter working properly. 4. To keep the blade turning smoothly, add a drop of sewing-machine oil on the plastic surface next to the blade. 5. Replace blades with burrs or nicks. These are evident when you cannot make a clean cut across the fabric. 6. If you work sitting down purchase a special cutter made for this. A regular cutter does not work at this angle. 7. Don’t try to cut too many layers at a time. Test your cutter to find the optimum number of layers it will cut accurately. The average is usually 6.